No doubt, heading into 2018, Canada is buzzing with innovation, super clusters and the Alberta government’s $1.4B plan to drive innovation in the energy industry and diversify the economy. “When the world thinks about new and better ways to produce energy, we want them to think about Alberta,” said Deron Bilous, Alberta’s minister of economic development and trade in December of 2017. And price? Yes, that too is looking better but we acknowledge that we have to look way beyond barrel price to under­stand the complexities in supply and demand in today’s global market. Are we finally at an inflection point in the oil and gas industry? Are we thinking and putting into action a sustained focus on innovation and looking toward sustain­ability built on a thriving eco­system? What about the changing of the guard — is the industry fo­cused enough on this? Firstly, when we think about the industry we need to think about the ‘energy’ industry because oil, gas, supply, production, pipelines, low-carbon, renewables, technology and innovation are intertwined into a mesh of complex interdependency — welcome to the global market. Nothing will transform in a year, but we believe a methodic and consistent transforma­tion is now underway. 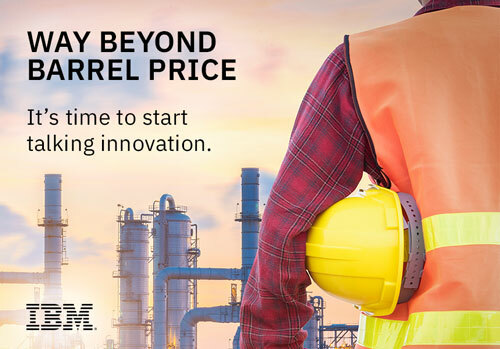 We’ve talked about industry collaboration and our IBM for Natural Resources Innovation program is a thriving example of this – ibm.com/oil-and-gas. Let’s pause to address this critical element in the state of the oil and gas industry as compared to our counterparts in the larger industrial segments. The oil and gas industry is still lagging other industrial segments like aerospace and defense and manufacturing. Canadian manufacturers have long been leaders in pursuing investment in research, transforming new discoveries into advanced products and technologies, and bridging the gap between research and the marketplace. The oil and gas industry needs to accelerate, and quickly. The time horizon between ideation and commercialization for transfor­mative technologies is too long, at eight to ten years that needs to change. What about the future leaders of tomorrow? They absolutely need to see the industry as innovative, leading-edge and and appealing. The changing of the guard is critical to the success of the industry. Remember the 2017 Superbowl commercial by the American Petroleum institute (API), “This ain’t your daddy’s oil,” which was supposed to portray a modern look at how oil is integrated into the products consumers use today and into the future? Well, it caused a great deal of controversy among millennials and that was a clear indication of who the future leaders of tomorrow will be. As the new natural resource of the twenty-first century, data has the power to transform industries and business models. The rise of the data scientist’s role in the industry moving forward will be critical to transform data into intellectual property (IP) for industry competitive advantage. The health of the industry ecosystem is also critical to the health and sustainability of our business. We’ve heard a lot about this lately, and innovation and technology labs are popping up all over. We have the Canadian government super clusters initiatives and the Alberta governments $1.4B plan to drive innovation forward in the industry. We know there are differences in opinion on whether we should have a systematic approach on the so called ‘big bets’ managed approach or take more of a lassiez-fair approach, but consistently the message is that innovation and technologi­cal advancement is the way forward. Advancements in technology over the last five plus years, cloud computing, sensor networking, Internet of Things (IoT) and artificial intelligence (AI) represent clear and tangible options for producing measured business value. This will enable the industry to move away from managing the ongoing cost of interfacing disparate applications and aging. We also talk about this in terms of the rise of the industry platforms. I encourage you to check out our work with Goldcorp2, one of the largest gold mining companies in the world, to get a sense of the business value realized when we forge together data science and platform centric approaches to business problems. We know we need a systematic approach to inno­vation. We need to change the internal culture in the industry. It’s an important shift that needs to take place — to drive forward the transformation that we believe is underway. Critical to this is our continued and diligent efforts to create, maintain and support viable ecosystems. With that, we must forge ahead in collaborative efforts and work together to continue to drive the industry platform visions that are possible with today’s enabling technologies. The industry on a global scale has common challenges with transforming from a reactive to predictive business environment. Are there ways we can work together to share historical data, learn from it and infuse that learning with AI capabilities to exponentially drive home the type of business outcomes we need? We believe there are, and in the process our industry will be healthier, more focused on innovation and more willing to work to move the needle forward to a more sustainable and profitable future. One that will be less dependent on the traditional energy sources we use today. So how is the industry doing in 2018? I think we’re headed down the right track, let’s keep driving innovation forward and looking for ways to work together to create new value common across the industry. 1 Canada’s oil and natural gas industry. Context digital magazine, Energy Examined, February 2018 as reported by the International Energy Agency (IEA) forecast. 2 Our Our Phase I Goldcorp work improved geological processing time by 35X, enabling geologists to decrease time spent manipulating data and spend more time finding correlations within their data sets. The Natural Resources Solution Centre in Calgary is dedicated to clients’ in the Canadian oil and gas and mining industries. We are currently embarking on a 4-year thirty-million-dollar innovation program that focusses on performance, productivity and safety in the Canadian oil and gas industry.